While there are often disputes over what age rating films should be awarded, New Zealand's censors have just gone a step further by banning a horror film from any kind of public distribution. The censors say that Maniac, a serial killer flick starring Elijah Wood, is potentially "injurious to the public good" and cannot be shown in theaters or released on DVD. Maniac's distributor says that the banning is an "invitation to piracy" and the signs are that's exactly what's happening. One of the most obvious signs of censorship in entertainment is the ratings system. The US has the MPAA, the UK has the British Board of Film Censors and New Zealand has The Office of Film and Literature Classification. They all have an influence over who can see what and are often dragged into controversy as a result. For the Kiwi censors, yesterday was one of those days. 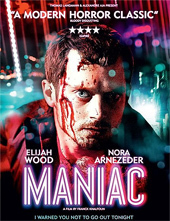 Maniac is French-American horror movie starring Elijah Wood as a sadistic serial killer. A remake of 1980 movie of the same name, the flick is somewhat of a bloodbath. It is also partly shot from a first-person perspective, meaning that the viewer gets to experience murders through the killer’s eyes. The Kiwi censors didn’t appreciate that. The Office of Film and Literature Classification decided that Maniac is so disturbing it shouldn’t be seen by anyone apart from those attending specialist festival screenings. It has been banned from both theatrical and DVD release. “The OFLC decision says that the film may be ‘injurious to the public good’ if it goes out on a wider release,” says Ant Timpson from the 2013 New Zealand International Film Festival. Needless to say, the movie’s distributor is not happy with the decision. And here lies the problem. While the MPAA, BBFC and OFLC in New Zealand might like to think they have the final say over what people can see, file-sharing networks simply don’t listen. With this in mind TorrentFreak decided to take a snapshot of activity of those sharing Maniac on BitTorrent networks. It’s unlikely that Monster Pictures (or the OFLC) will be happy with our findings. As expected the United States with its huge 314m population is well ahead in first place with 18.4% of the downloaders. In second with its 62.7m population comes the United Kingdom with 8.6%. But in third, punching well beyond its population of just 4.4 million, is New Zealand clocking up 6.7% of downloaders. By comparison, Brazil – also on 6.7% of downloaders – has a population of 197 million. When previously assessing other TV show and movie releases it’s been very rare for New Zealand to make a showing in the top ten, let alone the top three downloading nations. In percentage terms of overall downloaders, the turnout for Maniac surpasses that previously achieved by Kiwis for The Hobbit. Of course, all the publicity yesterday over the banning will have encouraged lots of Kiwis to obtain this now-forbidden fruit in any way they can, potentially upsetting the stats. However, with no legitimate way for them to grab a copy, numbers are only going to increase. The ban needs to be lifted quickly to do something about that. Interestingly, New Zealand also has another kind of film censorship enshrined in law. In order to prevent its theaters having to compete with, well, anyone, the Copyright Act 1994 bans parallel importation of films into New Zealand for a whole nine months following their international release date. That regime will continue for another three years, although amendments this month have shortened the restricted period to five months. In the meantime, let’s hope that file-sharers grabbing Maniac don’t turn into murderous maniacs themselves after their viewings, or the OFLC will only get even more power in the future.